trí cruindberrtha foraib it é comlebra for cúl & étan. Trí gerrchochaill dubae impu co ulnib & cendidi fota forna cochlaib. ‘Is andsa damsa a samail. Ní fetursa i nh-Érinn in triarsin manid h-é in triar ucut di Chruithentúaith de-deochatar for loinges asa tír conda-fil h-i teglach Conaire. & Curnach mac h-ui Fíaich. Trí laích ata dech gaibthi gaisced la Chruithentúaith in triar sin. three round heads of hair on them, even, equally long at nape and forehead. Three short black cowls about them reaching to their elbows: long hoods were on the cowls. ‘Hard it is for me to find their like. unless it be that trio from Pictland, who went into exile from their country, and are now in Conaire’s household. 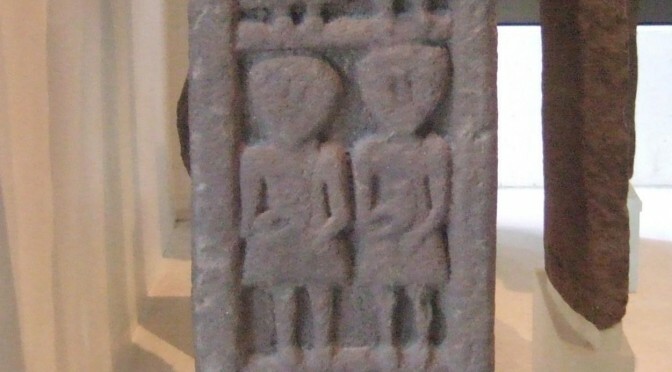 and Curnach son of Húa Fáich. The three who are best in Pictland at taking arms are that trio. ‘At-connarc isind leith atúaid din tig. Nonbur. Noí lennae corcrai tairsiu cen delgae indib. ‘.i. Ósalt & a da chomalta. Osbrit Lamfota a da chomalta. Lindas & a da chomalta. Tri rigdomna do Saxanaib sin filet ocond ríg. ‘On the northern side of the house I beheld nine men. Nine very yellow heads of hair were on them. nine purple plaids over them without brooches therein. ‘We know them,’ he said. Lindas and his two foster-brothers. Three crown-princes of England who are with the king. I was interested in the descriptions of the individuals’ clothing and accoutrements. This section of the story is a long and detailed description of the physical appearance of each nobleman in the Royal party in turn, mentioning their shirts, cloaks, brooches, weapons, hair, etc. I am imagining that we see here some kind of attempt on the part of the Irish storyteller, to caricature the distinctive appearance of foreign people at the Royal court. I wonder how much these caricatures reflect genuine clothing and appearance habits of the Picts and the English respectively?